Matt Damon & Luciana Barroso choose St.Lucia to renew their Wedding Vows! Chosen as the setting for the finale of the TV show “The Bachelor” and described by Oprah as one of the 5 places to see in a lifetime, Saint Lucia is the ultimate romantic escape. It is no surprise that Matt Damon and his beautiful wife Luciana Barroso chose it for their exclusive Vow Renewal ceremony on April 13th. The couple, who first tied the knot at City Hall in NYC in December 2005, rented out the recently renovated Sugar Beach Resort with a star studded invitation list that included George Clooney, Brad Pitt, Angelina Jolie, Ben Affleck and Jennifer Garner. Damon and his bride, who chose a Naeem Khan pale chiffon tulip gown with a dramatic neckline and heavily beaded waist for the ceremony, exchanged vows under thatched roofs right at sunset. The couple’s daughters — Isabella, 6, Gia, 4, Stella, 2, and Alexia, Luciana’s teenage daughter from a previous relationship — were in attendance and wore light-colored dresses to match their mom. 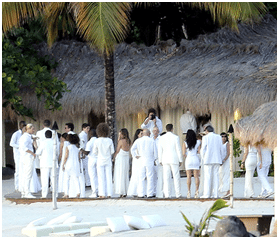 After the ceremony, guests, who all wore shades of cream and ivory, enjoyed a glamorous cocktail reception on the beach. Once again Saint Lucia’s tropical charm and dramatic scenery have enchanted the show biz… who’s going to be the next movie star to land on our beautiful shores? Drink a Piton at the Top of the Pitons!